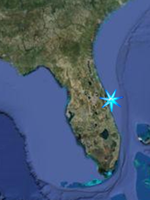 Directions; From Daytona Beach, take I-95 south toward Miami. Take SR-421, Exit 256, toward Port Orange. Take the Taylor Road ramp toward Port Orange/Daytona Beach Shores. Merge onto FL-421 East. FL-421 east becomes FL-A1A North/Dunlawton Avenue. Turn right on South Atlantic Avenue (4075) and drive straight to the park. Lighthouse Point Park consists of 52 acres of pristine land on the north side of Ponce DeLeon Inlet in the Town of Ponce Inlet. The 52-acre park features fishing, nature trails, an observation deck and tower, swimming and picnicking. A variety of wildlife call the Lighthouse Point Park home, including raccoons, possums, skunks, armadillos, shore birds and birds of prey. There are two distinct districts with two separate entrances and you cannot drive between the two. The North or Apollo District is accessed from New Symrna Beach in Volusia County while the South or Playalinda District is accessed from Titusville. 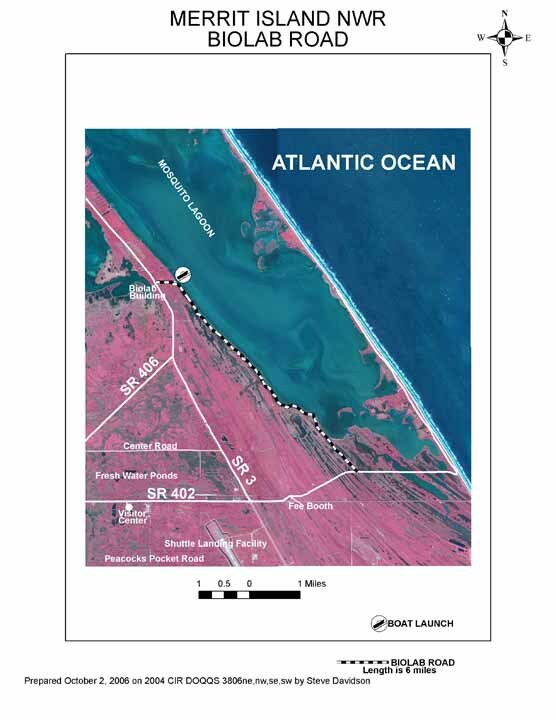 Owned by NASA, this property is managed by the National Park Service and protects roughly 26 miles of Atlantic Ocean Shoreline and provides nesting grounds for up to 7 species of sea turtles while protecting natural dunes, coastal strand scrub, salt marsh and other wetlands, and virtually the entire body of the Mosquito Lagoon. Over 300 species of birds have been seen at the seashore from gulls, pelicans, ducks, herons, egrets, terns, gannets, assorted shorebirds, and raptors, to painted buntings, migratory songbirds in the hammock areas and scrubjays just inside the north district entrance. The North District is accessed through the city of New Symrna Beach in Volusia County by driving due south on Highway A1A from town. There are five Beach Access Points along the Apollo Beach (North District) section of Canaveral, with the first of these is right at the entrance or pay station of the Seashore, and the last about 6.4 miles south on Atlantic Ave. Each of these provide opportunities for seeing gulls, terns, gannets, and various shorebirds while the scrub on the dunes can hold gopher tortoises and various migratory bird species. The beaches also provide another opportunity, although rare. Each winter, Northern Right Whales migrate south from their feeding grounds off of the Northeastern United States to the area from the Georgia Border to Sebastian Inlet in South Brevard County to mate and calve. The occasional sighting of a mother and her calve just a few hundred yards offshore can be a spectacular site. Also look for Atlantic Bottlenose Dolphins and the occasional jumping Manta Ray. Turtle Mound Trail leads to the Turtle Mound, so named because it loosely resembles a turtle. The Turtle Mound is a Timcuan Indian midden, not to be confused with an Indian Burial Mound. A midden is essentially a garbage pile made over many years as the Timicuan discarded the shells of oysters, clams and other shellfish that they depended on heavily for food. Other artifacts were tossed in as well. Today this mound is roughly 35 feet in height and is a protected treasure trove of insight into the lives of the Timicuan before the arrival of Europeans. The trail is roughly 1/3 of a mile in length. This short trail can be accessed from parking area #8 and leads to the Eldora State House, after passing through a coastal hammock. Built during the 1800s the house was one of several large houses built in the community of Eldora after the Civil War and later served as a hotel for passengers traveling by steamboat along the Mosquito Lagoon. Eldora Hammock is a one mile loop taking visitors through a coastal hammock, good opportunities for seeing migrant songbirds and learning about this habitat through interpretive signage. 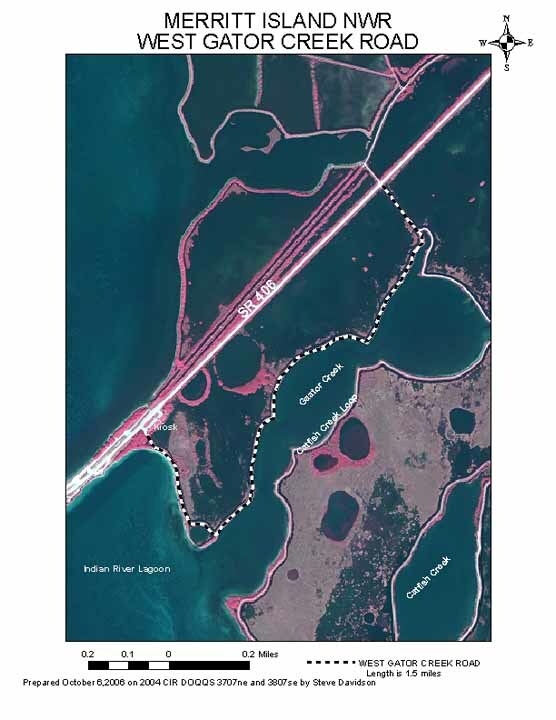 This is a one way trail about a half mile in length that provides a unique birding and ecotouring opportunity, by allowing you to travel from the Atlantic Shoreline to the Mosquito Lagoon, noting the changes in vegetation, geology or topography and the wildlife. On the lagoon end of the trail is Castle Windy Midden, a Timucaun Indian shell midden. The South District can be found by driving across the Max Brewer Causeway from Titusville through the Merritt Island National Wildlife Refuge, staying to the right when you see the sign for Black Point Wildlife Drive. You are now on SR 402. Stay on this road past the red light at SR 3, through the pay station until the road turns to the north at the beach and you see the numbered beach access points. There are 13 Beach Access Points along the Playalinda Beach (South District) section of Canaveral. After the pay station. Each of these provide opportunities for seeing gulls, terns, gannets, and various shorebirds while the scrub on the dunes can hold gopher tortoises and various migratory bird species. The beaches also provide another opportunity, although rare. Each winter, Northern Right Whales migrate south from their feeding grounds off of the Northeastern United States to the area from the Georgia Border to Sebastian Inlet in South Brevard County to mate and calve. The occasional sighting of a mother and her calve just a few hundred yards offshore can be a spectacular site. Also look for Atlantic Bottlenose Dolphins and the occasional jumping Manta Ray. The Vistas of the Southern District of Canaveral National Seashore are between the Pay Station and the Beach Access Road as it passes through the southernmost wetlands and impoundments of the Mosquito Lagoon. They offer places to pull off of the entrance road and scope or take in the great views of the impoundments, wading birds, waterfowl, or many other species, as well as the Space Shuttle Launch Pads. In fact, this is as close as you can get to a launch pad without either working at the Kennedy Space Center, taking the Kennedy Space Center Visitor Center Bus Tour or having a NASA Pass. (Note, the refuge and seashore are closed for launches) There are 7 of these sites past the pay station and are the only places where it is allowable to stop your car except in case of emergencies. (Birdwatching is not an emergency). many of these offer spectacular vantage points of expansive saltmarsh wetlands. Satellite image of Vistas shows Vistas 2 - 4 with #3 marked. 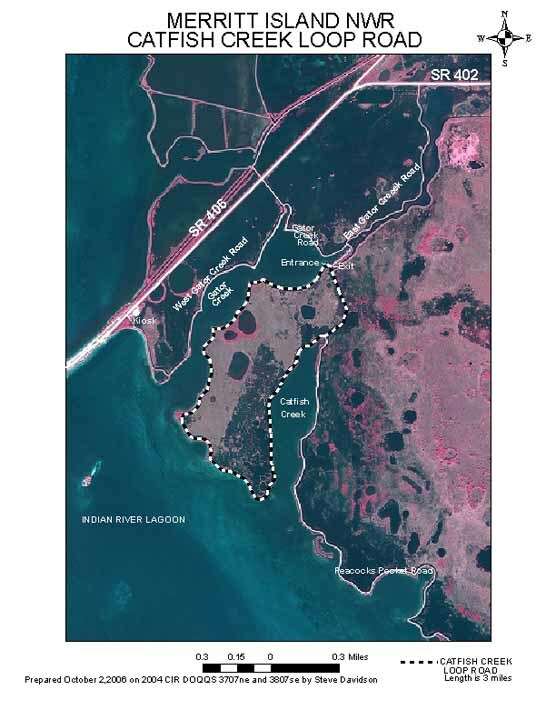 Eddy Creek is located between beach parking lots 7 and 8 and provides to only access to the Mosquito Lagoon within the southern district of the Seashore. From the shoreline you can spot for pelicans, waterfowl and wading birds in the cove while also scanning the trees surronding the cove for neotropicals. Owned by NASA and home of Kennedy Space Center, the Merritt Island National Wildlife Refuge has been managed by the US Fish and Wildlife Service since 1963. Though there are four entrances open to NASA workers, only two are available to provide access to the public portions of the refuge, and they are the Max Brewer Causeway in Titusville and the State Road 3 entrance from US 1 just south of the town of Oak Hill in Volusia County. This is a large refuge, 140,000 acres and there are many locations scattered throughout the refuge that provide access to some of the best bird and wildlife watching to be found anywhere. In order to provide the most complete guide, each site will be handled separately as individual destinations, starting with Wildlife Drives, then Hiking Trails, and finally Drive to Vantage Points. There is only one designated wildlife drive on the refuge, but it is dedicated for wildlife observation only and that is Black Point Wildlife Drive, where no fishing is allowed however, there are many other dike impoundment roads available for bird and wildlife watching from the car, although you may be sharing the road with fishermen, and they may be closed off to all but Duck Hunters during hunting periods. Photography hint; Many birds that would otherwise be frightened by a human figure are not frightened by a motor vehicle. These roads give photographers with lenses in the 150-300 mm ranges their best chances for impressive bird portraits. Use a small pillow or a bean bag on a window raised or lowered to the correct height to steady the camera. Turn the motor off to eliminate vibration from the engine and shoot from the car. There are also specialty camera supports for photography from a vehicle. The point is to use the vehicle as a mobile photo blind and avoid the temptation to get out of the car as this will likely spook the birds. East Gator Creek can be accessed from two locations. The first is a shared entry with West Gator Creek on the right less than a mile from the Refuge Entrance Kiosk while the second is west on SR 406 until after it veers to the right at the turnoff for Black Point. (Where it becomes SR 402). Just after this point you will see the second entrance on the right. Catfish Creek is accessed from East Gator Creek Road, which is accessed from the shared entrance of Both Gator Creek Roads. Take state Road 406 a bit less than a mile into the refuge from Titusville and turn right onto Gator Creek Road, then take the first left intersection you come to, this is east Gator Creek Road. Follow the road around the shoreline until you come to a right intersection. Take this and you are on Catfish Creek Road, which leads to and loops around a salt marsh impoundment. When you come to a three way intersection, a left turn will take you to the northwestern shoreline of catfish creek, you will pass one more side path on your left which is Peacocks Pocket Road. 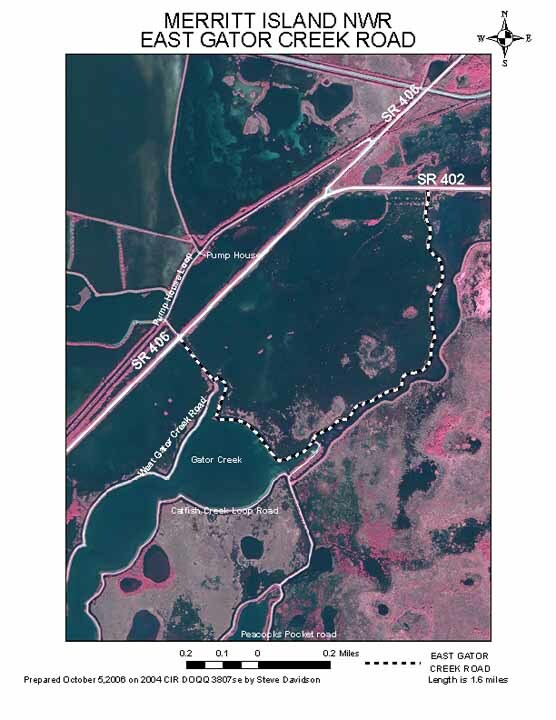 Stay on Catfish Creek road and you will travel to the Indian River lagoon Shoreline, follow the shoreline around to the South East Shore of Gator Creek and back to the three way intersection marked by the Green Arrow on the Google satellite Image. Peacocks Pocket is accessed from State Road 406. A little less than 1 mile into the refuge, turn right on Gator Creek Road. Take the first left on East Gator Creek, then take the first right on Catfish Creek Loop Road, then take the next left at the three way intersection follow the shoreline and take the next left. This is Peacocks Pocket Road which lead to the shoreline of the Indian River Lagoon and follow it all the way to Peacocks Pocket, one of several coves in the area. When the lagoon shoreline section of the road ends it will turn left be a straight shot for a little over 2 miles through wetlands and pine forest back to State Road 402 near the Refuge Headquarters.To head back to Titusville, turn left. Biolab Road is accessed by following State Road 406 from Garden Street in Titusville. After entering the refuge look for the turnoff to Black Point Wildlife Drive at the bend in the road. Turn off here and follow the roadway past the entrance to Black Point until it ends at State Road 3. Turn to the north and look for NASA's Atmosheric Sciences Laboratory about 1 and 1/2 miles on the right (east) side of the road. Turn onto the dirt road and befor you get to the boat ramp at the end you will see a right turn. This is Biolab Road, which will take you along the shorline of mosquito lagoon to you're left and wetlands and salt marsh on your right. Look for alligators along the roadside canals, herons and egrets in the wetlands and white pelicans in the lagoon. Editors Note; If you really want to see an alligator, the canals that follow this road that were built when the dike road was built is THE best place to see them. Along most of the dike roads including Black Point you might see one, two, or maybe three. In one trip along Biolab I counted several dozen big ones. There are several hiking trails on the refuge and they offer a chance to experience a variety of habitats and the birds and other wildlife species associated with those habitats. Photography hint; Let's say you're hiking the Cruickshank Trail and there is a heron near the shore by the trail, or just across one of the channels that line the trail in a mangrove tree. You want to get a good shot with your camera but you are worried about spooking the animal into flight. If you try to stalk the animal you will spook it. Why? Because you are acting exactly like a predator. Being sneaky while keeping your eyes on the animal will scare the bejesus out of it. That's exactly what bobcats and other predators do. Stay in full view of the animal and don't stare. Act like you don't care if it is there. Look around on the ground, whistle softly, move casually, no sudden moves, etc. To get to the refuge visitor's center, stay on the main road as it veers to the right (at which point it becomes State Road 402). You will soon see the entrance on the right about 2.3 miles past the Black point turnoff. The Visitor's Center has interactive displays and an information desk inside, and outside has a dock leading over one freshwater pond with an osprey's nest visible on an elevated platform, To the right, a boardwalk winds along the shoreline habitat leading to a gazebo over another pond. Red bellied and pileated woodpeckers can be seen as well as northern parulas, gray catbirds, carolina wrens, american redstarts, and many other songbirds. The Hammock Trails are found about a mile east of the visitor's center on the left, where parking is provided and two loop trails take you through the hammocks and wetlands. The Oak Hammock trail is about 3/4 mile in length while the Palm Hammock Trail runs about 2 miles. Both of these trails can be pretty wet following periods of rain and be sure to bring plenty of bug repellent from about March through October. Songbirds, Peleated woodpeckers, and raptors can be spotted along these trails along with some wading birds. Other possible sightings include bobcats, raccoons, and other woodland wildlife. Bird trail is the first of two trails accessed from Black Point Wildlife Drive. The trailhead is about 1.7 miles into the wildlife drive to your left. There is a parking area just past the trailhead and the trail is due south This short trail offers an ADA accessable elevated viewing platform overlooking a shallow marsh. Wading birds and shorebirds often gather here in large numbers. Spotting scope included on platform. About halfway through Black Point Wildlife Drive there is a parking area with restrooms forming the trailhead for the Cruickshank Trail, a walking trail that follows the impoundment dike around the wetlands for about 4 1/2 miles. Good place for egrets, herons, ducks, pelicans, and numerous other waterfowl. Just a few hundred feet to the left of the trailhead is an elevated platform with a mounted spotting scope for viewing the vast salt marsh visible from this elevation. The Scrub Ridge Trail features the favored habitat of the Florida Scrub Jay, an endemnic species to the state, existing nowhere else. It is a one mile loop through a habitat of low lying scrub oak and palmetto bushes. In addition to the Scrub Jay, many migratory birds use the low scrub for food and habitat while the skies are often patrolled by Raptors. Indigo snakes, gopher tortises, armadillos, and bobcats are other possible sightings. The trailhead can be found by taking the Max Brewer Causeway across the river (SR 406) and taking The Black Point turnoff to the left then continuing on past the entrance to Black Point Wildlife Drive until the road ends at SR 3. Turn left (north) and you will see the sign pointing the way down a dirt road on your right (east) to the trailhead. Most of the vegetation here is pretty low (ie, not much shade) so I would recommend bringing a hat, sunscreen, and water. 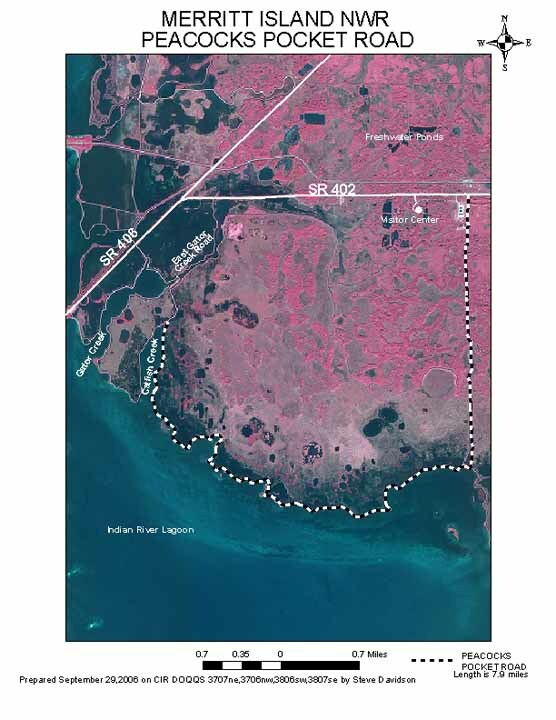 The Pine Flatwoods Trail is located north of haulover Canal on the east side of State Road 3 and is a one mile loop through a pine flatwoods. The trailhead can be found by taking the Max Brewer Causeway across the river (SR 406) and taking The Black Point turnoff to the left then continuing on past the entrance to Black Point Wildlife Drive until the road ends at SR 3. Turn left (north) and drive for 7.2 miles. The trailhead will be on the right (east). Located a few hundred feet to the left of the Cruickshank Trail Trailhead is an elevated platform with a mounted spotting scope for viewing birds within the vast salt marsh visible from this elevation. From Titusville, take SR-406 to sr-3 and head north until you cross over the canal, then take the first right and follow the road to the deck parking area. From Oak Hill, just follow SR-3 south and turn left just before the bridge. Located on the Nartheast side of Haulover Canal, the manatees seem to love to hang out in large numbers near this deck. If you really want to see a manatee, this is the most likely place. The Haulover Canal area has several good vantage points for setting up a spotting scope and scoping for birds but the best is probably the North side of the canal at the Westernmost end. Here you can see Bird Island, the rookery island to the west and explore the cove adjacient to the canal. Look for dolphins and manatees entering the canal here as well as ospreys, waders, pelicans, comorants, and many others. From Titusville, take SR-406 to sr-3 and head north until you cross over the canal, then take the first left and follow the road to the canal, and turn right to the end of the road. From Oak Hill, just follow SR-3 south and turn right just before the bridge, follow the road to the canal, and turn right to the end of the road. You can also stop at several of other spots along the canal for viewing. From SR-528 (Beeline Cswy) take SR-3 north for 5.5 miles. Turn left on Pine Island Rd and go 2.5 miles to the unpaved parking area at the entrance. From SR-520 go north on Courtenay Parkway (SR-3) across the Barge Canal and continue for 5.5 miles. Turn left on Pine Island Rd and go 2.5 miles to the unpaved parking area at the entrance. Pine Island is not actually and island. The name comes from the fact that an "island" of pine flatwoods is surrounded by other habitats, including on one edge the Indian River Lagoon without the normal habitat transition from pine flatwoods to wetlands to lagoon. There are also mangrove forests, hardwood hammocks, and cabbage Palm Hammocks. The diversity of habitats for many species of wading birds, shorebirds, waterfowl, and migratory birds is a prominent feature of the conservation area. Reptiles and amphibians including alligators and aquatic turtles are common, as are mammals such as bobcats, river otters, raccoons, and opossums that seek food and refuge on the site. FROM US Hwy 1, take SR-528 east 2.7 miles, turn left onto Courtenay Parkway (SR-3) and go 3.1 miles.Turn right and go 0.9 miles on Chase Hammock. This is a 240 acre park with a manmade freshwater lake and a myriad of creeks and smaller brackish ponds that make for a very interesting birding and wildlife area, especialliy with the addition of the multiuse trail on the property, which runs along one of the creeks. There are also several rustic hiking trails through the park for some off the beaten path hiking. Look for wading birds and other waterfowl along the creeks and backwaters, and migratory songbirds and raptors in the wooded sections. Editors Note; The County website lists this area as a freshwater habitat due to the deep manmade lake on the property. However, long before the park was built I frequently fished the creeks and smaller backwater coves in the area and caught a mixture of fresh and saltwater fish such as small snook, tarpon, seatrout and jack crevalle, along with freshwater bass, bluegills, and other species. For this reason I am listing this as both a Freshwater and Saltwater Estuary property on the wildlife watching pages. The Entrance to Spruce Creek Park is on US-1 in Port Orange 5.5 miles north of the intersection of State Road 44 and US-1 in New Symrna. If approaching from the South a U-turn will have to be made north of the park. Spruce Creek Park is located on 1,637 acres. Its 536-foot boardwalk begins more than three miles of nature trails leading to the 15-foot observation tower and continues to Rose Bay. The tower overlooks the marsh area near Spruce Creek. From Brevard County proceed North on US-1 to Oak Hill. (DO NOT SPEED THROUGH OAK HILL.) You will come the the intersection of Halafax and US-1, the only light in town, a flashing yellow light. Two miles north of this intersection turn right on H H Burch Road and the entrance to the park will be about .4 miles down on the left. Situated on 37 acres with 5 acres directly on the water, Riverbree is a beautiful park in the small town of Oak Hill in southern Volusia County. A Nature Trail combined with a large dock overlooking the northern Mosquito Lagoon offers a great chance to Scope the opposite shoreline of one of the many islands in this part of the lagoon. An oyster bed lies inland of the end of the dock, exposed at low tide while the rest of the park is naturally wooded and a trail is provided. Seminole Rest is owned by the National Park Service and part of the Canaveral National Seashore although it is a stand alone destination on the mainland. It is primarily a Historic Site containing a large Indian Midden and the historic Instone House built before 1890. However the park also offers great views of the Mosquito Lagoon and an interpretive trail around the park. FROM US Hwy 1 at Garden Street (SR-406), go 11.3 miles north on US Hwy 1, turn right on Huntington Avenue and go 1.9 miles. Scottsmoor Landing in North Brevard is a small County Park with a boat ramp into the northern reaches of the Indian River Lagoon. However it is a great place to scope for wading birds on the flats of the lagoon while at the same time a vantage point for the shoreline salt marshes. The road leading to the park is rural and also provides opportunities to stop and scan the forested wetlands for migratory songbirds. FROM US Hwy 1 at Garden Street (SR-406), go 4.9 miles north on US Hwy 1, turn right and go 1.2 miles on Wiley Avenue, then go left on Hammock Road 0.2 miles, turn right and 0.1 miles on Jones Avenue. Primarily a Boat Launch Site, there are two small islands just offshore of the park where you can scope for Gulls, Terns, Shorebirds, Waterfowl, and Dolphins. Scope the lagoon for osprey, pelican, waterfowl, look for small shorebirds on the shoreline rocks and scan waters just off the rocks, the marina basin and the entrance to the marina for Manatee. Follow the main entrance road towards the lagoon and veer to the left to the last parking circle. Scan the lagoon for osprey, pelican, gulls, terns, and other waterfowl, the shoreline rocks for small shorebirds, and the water near the rocks and in the marina basin for manatee. ADA ACCESSIBLE: Parking, Boat Trailer Parking, Restrooms in Developed Area, Fishing Deck, Boat Ramps. From the fishing deck, scan the lagoon for osprey, pelicans, and other assorted waterfowl while the seawall along the corner by the boat ramps is a good place to watch for a small pod of dolphins that frequent the area. You can also drive east past the main parking lot and Marine Patrol Station and sometimes see large flocks of gulls, terns, and on many occasions black skimmers lined up in formation on the sand, as well as herons osperys, pelicans, and on windy days, the colorful sails and kites of windsurfers and kitesurfers. FROM SR-50, go north 4 miles on US Hwy 1, turn right on Broad Street and go 0.1 miles. FROM Garden Street/SR-406, go south 0.1 miles on US Hwy 1, turn left on Broad Street and go 0.1 miles. Open after 7:00 a.m. until dark, except for scheduled use. Two fishing docks, one with a gazebo. FROM SR-50 go north 1.5 miles on US Hwy 1. The park is along the river. Open after 7:00 a.m. until dark, except for scheduled use. On US Hwy 1 just .25 miles south of SR-50 on the Indian River. This 5.38-acre community river park features a paved shoreline walkway with benches for wildlife, launch viewing and fishing; a boat ramp with central dock; pavilion, 2 grills, restrooms, and parking. FROM US Hwy 1 at Fay Blvd, the park entrance is just south of the intersection along the Indian River. FROM SR-520 go 8.8 miles north on US Hwy 1, the park is on the right just south of the Fay Blvd intersection.